Prosecutors arrested chiefs of the two UZ departments. 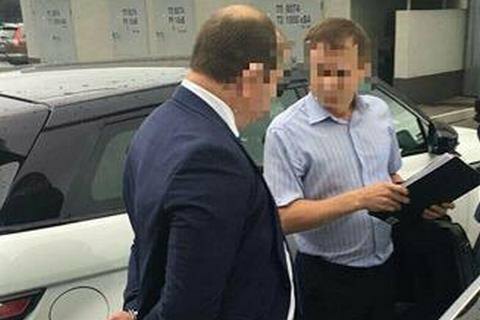 Law enforcers detained two managers of the national railway company Ukrzaliznytsia for extorting a bribe of $ 150,000, Prosecutor-General Yuriy Lutsenko says. "Head of the Department of Property and Land Resources Andriy Tymoshenko and deputy head of the legal department Yashchenko are detained," Lutsenko wrote on Facebook on Thursday, 6 July. Ukrzaliznytsia said in a comment that the Security Service of Ukraine and the Kyiv city prosecutor's office were raiding the administrative building of the UZ and a number of structural divisions. The company said the searches , sanctioned by a metropolitan court are within the criminal proceedings launched in mid-March regarding a land lease contract in the town Piskivka, Kyiv Region. UZ draws attention to the fact that one of the detainees, the deputy head of the legal department of the company, was hired on 1 June, and did not have any previous experience in the field of railway transport. The press service of the Kyiv Prosecutor's Office said Thursday that the two railway officials have agreed to accept a 4mn hryvnia bribe from a Kyiv businessmen to approve the contract on the lease of 9 ha land plot of land in the territory of Piskivka. The detained may face the imprisonment of up to 12 years. The investigation team are searching the offices of Ukrzaliznytsia and defendants' homes. In June, law enforcers reported opening a number of criminal cases against UZ officials and raided company's central office on 13 June. The job contract with the head of Ukrzaliznytsia Wojciech Balczun ended on 5 June. The Cabinet is to decide on the contract's extension in the near future.